Some days are easier than others for Siobhán Carroll, but there is never an easy day. Sometimes she can roll out of bed without too much thought, other times it takes a couple of deep breaths before that first step of the day can be taken and that is often how she and her husband Noel get through the day, one step at a time. 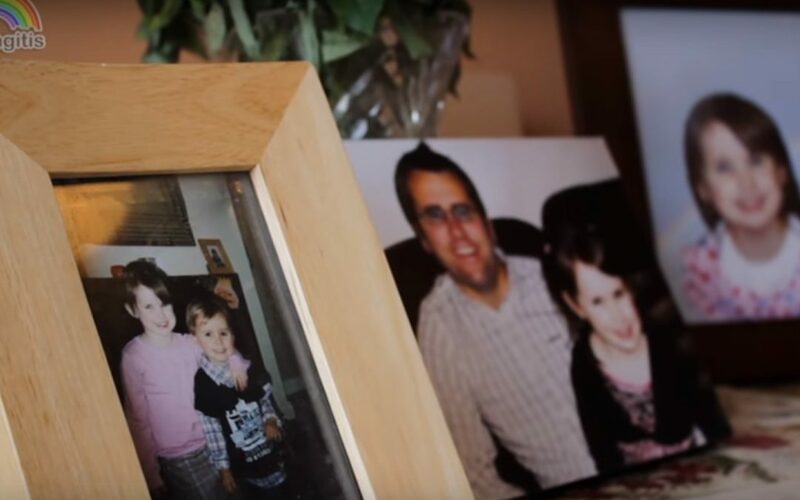 The 2nd of April 2008 saw Siobhán and Noel’s lives turn completely upside down, when the ultimate horror for a parent visited them, the death of a child. Their eldest child Aoibhe, who had turned 4 in January, woke up in the middle of the night of the 1st of April, with vomiting and diarrhoea. Noel was at home alone with Aoibhe and her brother Eimhin, who was 2 years old. Please subscribe to our YouTube channel and help us spread awareness about the signs and symptoms of meningitis. Siobhán, who was pregnant with their third child, was experiencing some difficulties related to her pregnancy and so was in hospital for overnight observation. Noel comforted Aoibhe, changed her and when she fell asleep again, tucked her back into bed and rang Siobhán in the hospital to let her know Aoibhe had been sick. “I didn’t suspect a thing, sure how could you? Yes, I was worried that one of the kids was sick, but the kids get sick all the time. I had spoken to her on the phone earlier in the evening before she went to bed and she was in great form, so I wasn’t overly worried”, Siobhán says. However Aoibhe got sick again later in the night, setting off alarm bells with Noel and he called the doctor, who told him it sounded like Aoibhe had a vomiting bug. As her condition deteriorated during the night, he rang the doctor a couple of times and followed the advice given. At this stage Noel was sitting on the couch in the sitting room of their house in Oranmore in the early hours of the morning, cradling Aoibhe in his arms. They were watching cartoons around 5:00am, when Aoibhe’s eyes closed and Noel thought she was drifting off to sleep, but then he noticed her lips had started to turn blue. He immediately rang an ambulance and phoned Siobhán to tell her Aoibhe was not well and there was an ambulance coming out. “I was obviously very worried then and I spoke to Noel when the ambulance arrived and he told me that they were working on her. I didn’t know what he meant by working on her, sure she only had a vomiting bug”, she says. What Siobhán didn’t know was by the time the ambulance had arrived to the house, Aoibhe had stopped breathing. The ambulance crew worked furiously on the little girl and managed to revive her and she was rushed into hospital. “I was being kept in for the night for observation, so when Noel told me she was on the way in to the hospital in an ambulance, I made my way over to accident and emergency to wait for them. I remember standing outside in the dark. It was the middle of the night, so it was very quiet and off in the distance I could hear a siren and I said to myself, God it sounds as if someone is very sick, God love them without realising it was the ambulance rushing Aoibhe into hospital. The ambulance pulled up, the doors opened and someone just ran out straight past me and into accident and emergency, followed by the ambulance crew and Noel with Aoibhe”, Siobhán says. “Aoibhe died within an hour, an aggressive strain of meningitis taking her life”, she says, in hushed tones, her voice trailing off. At the start of the interview Siobhán hands me a printed page. This included details of what happened that night, with the explanation that she can’t bring herself to talk about the horror that visited her and her family. Over the 2 hours we spent talking, she dips further and further into some hidden well of courage, to give voice to that earth-shattering early morning. “I was in hospital so I never got to hold her, I never got to say goodbye to her and that’s very hard to take. She was gone, just like that. We were great friends, great buddies. I’m thankful for the fact that I didn’t go back to work after she was born, so I had that precious time with her”, Siobhán says. “God I miss her so much, it’s still hard to believe she’s gone. She was a great little character. We’d go shopping together and when we were on the way home, we’d hatch a plan that I would go in and distract Daddy, so she could run upstairs and hide the bags of things we had bought in the wardrobe. She was really looking forward to starting school. She was in the Naíonra and was loving it there and she just couldn’t wait to start in ‘big school’, as she’d say. Her photo was on the front of the Tribune when she was born. She was born at 12:06am on New Year’s Day in 2004, the second baby born in Ireland that year. That’s the thing, we start every year on her birthday, every year without her, which is unbelievably hard”, she says. “It’s the loneliness that’s the biggest thing. You have this huge pain in your heart and it never, ever goes away. You don’t even learn to deal with it, you just understand that it will be there forever and you work out how you can live from day to day with that pain, but we still have some really bad days”, Siobhán explains. Siobhán and Noel were naturally devastated, as was their second child Eimhin, who shared a room with Aoibhe. “He went to bed and she was there in the room with him and when he woke up in the morning she was gone and not just gone from the room, but gone. We told him that holy God wanted Aoibhe to live with him and he was very angry with that. He would ask us to get a ladder so he could climb up to Heaven and see Aoibhe and asked could she come back and play with him some time and if she did, could she take off her angel clothes and put on her normal clothes. As he gets older, he still talks about her”, she says. 4 weeks after Aoibhe died, Siobhán gave birth to their son Noah and their youngest child Sophie was born in December 2009. “Both have been told about Aoibhe and they, like Eimhin, regularly ask about her”, Siobhán explains. Siobhán, who is a native of Riverside in the city and Noel, who is originally from Ballybane, wanted to do everything they could, to prevent another family going through the horror they did. So they threw themselves into raising awareness of meningitis. “Noel ran the Galway City half marathon last year, along with 100 friends and colleagues of his from An Post, which has been hugely supportive of the family since Aoibhe died. And it’s not just An Post which has shown great support for the family”, she explains. “The amount of people who contacted us offering their support after Aoibhe died was unbelievable. Then when we started holding fundraisers and awareness campaigns on meningitis, we never got a ‘no’ answer when we asked someone for support”, Siobhán says. They have held a number of fundraising and awareness events around Galway in the past 3 years, the most recent being a 5K race in Oranmore in July. They hoped to attract 250 competitors. More than 700 people turned up. “We held an awareness morning in Busy Bees in Oranmore one day and we hoped to get a good crowd. We ended up having to turn people away as it was filled to capacity. The support from people has been fantastic and that’s why we decided to set up ACT for Meningitis”, she says. Having seen the reaction from people, both in terms of support and in relation to those their message has touched, they decided to set up an awareness charity in Aoibhe’s memory. ACT for Meningitis was officially launched in the House Hotel in Galway City. The ACT stands for both the Aoibhe Carroll Trust and also represents the 3 key messages Siobhán and Noel want to get across to people in relation to meningitis. “The ‘A’ stands for ask, as in ask yourself could these symptoms be meningitis. The ‘C’ stands for contact your doctor and the most important one is the ‘T’, which stands for time – every second counts, trust your instincts. We are focused solely on awareness and we want to try and educate people”, Siobhan explains. “If you ask people about the signs and symptoms of meningitis, most will tell you to look out for a rash, but in the majority of cases, there is no rash. Aoibhe didn’t have a rash. That’s the kind of thing we want to tell people about, to be aware of all the symptoms and not just go looking for one that might not be there. Aoibhe never got to go to her ‘big school’, but every Christmas the school has a Brontannas Aoibhe event, where pupils are asked to bring in presents of food, which is donated to the St Vincent de Paul. It’s wonderful that the school is keeping her name alive like that and that is what we want to do with the charity, to keep her name alive and hopefully keep people alive as well. Meningitis is the biggest killer of children under the age of 5 in Ireland. Last year there were almost 300 cases and 10 deaths. We want to try and bring that number of deaths down”, she says.